Part of the local landscape since the 1930s, the humble Australian tray-back has evolved way beyond any vision its originators might have had for it. 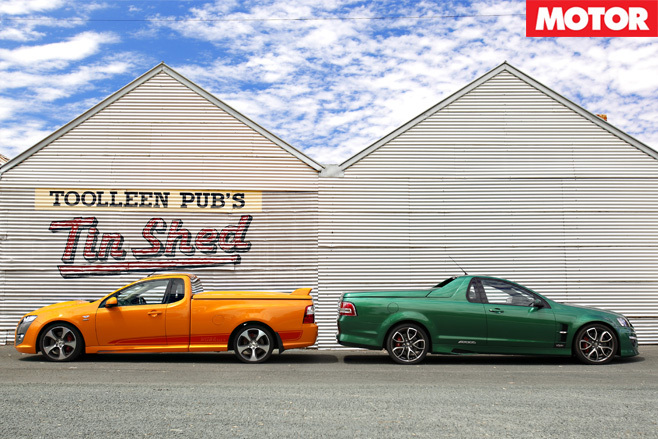 The modern ute is, of course, a product of its times. And with fringe benefits tax legislation favouring commercial vehicles and pastimes such as dirt-biking flourishing, it's no wonder that both HSV and FPV have offered up high-performance toy-haulers for tradies with a bit more gold to splash around. While it's true that all vehicles have expanded their performance envelopes over time and that niche marketing has led to a whole raft of new market segments, I'd still love to see the look on Lew Bandt's face (the Ford engineer who designed the first ute back in the 30s) if he was to gaze down and spot either of this pair. Ever since Holden (and HSV) shifted to the Chevrolet-sourced LS-series of bent-eight engines, Brand H has had a bit of a jump on Ford and FPV. These days, there's still a gap in terms of capacity, with the HSV sporting 6.2 litres courtesy of its LS3 and the FPV making do with 5.4 litres. Of course, it's not quite that straightforward, with the Henry running quad overhead camshafts and the LS3 sticking with a relatively simple single cam and pushrod valve operation. But in outright power terms, it's never been closer, with the Maloo kicking out 317kW and the Super Pursuit claiming 315. The Newton-metre count is all but identical, too, with 550 for the HSV and 551 down in Ford Town. They’re closer than ever in respective performances on the drag-strip, too. 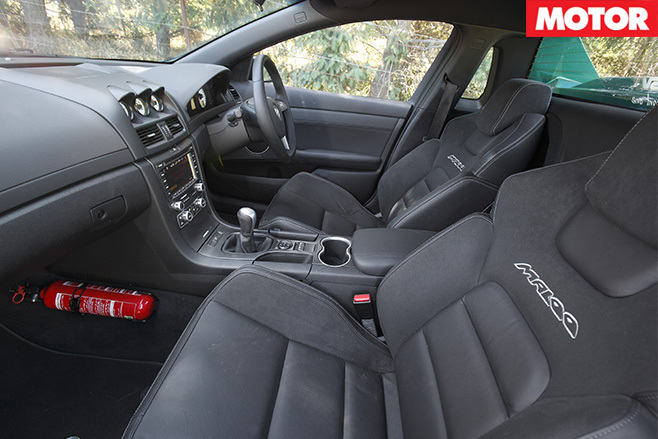 The Maloo, with its manual gearbox, is harder to launch cleanly, although you can rely on the new-for-Series-2 launch control to help it out of the box. Well, at least in theory. We managed to beat the launch control's best time by two-tenths of a second, with a 14.2sec run that netted a terminal velocity of 167.3km/h. Thing is, that's not as quick as we'd hoped. And the 0-100km/h time of six seconds dead was also something of a let-down. But what we really didn't see coming was how small the gap back to the FPV was. Okay, the Super Pursuit test car is an auto and everything, but 0-100km/h in 6.4 and a standing 400m of 14.5 at 166.2km/h is as close to its HSV opposite number as it's ever been. What the drag strip masks is the real difference in these engines. See, while the power and torque peaks might be in the same ballpark, the way and the where of those output deliveries is the critical difference. The defining difference, in fact. You can really see the difference in the 80-120km/h times in the various gears. 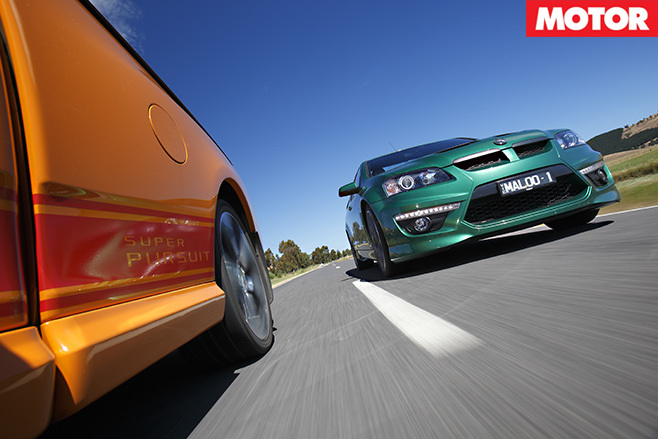 While the HSV's ultra-long sixth gear nobbles it from 80km/h up, in both fourth and fifth cogs the Maloo beats the Super Pursuit to 120km/h by almost two and three seconds respectively. 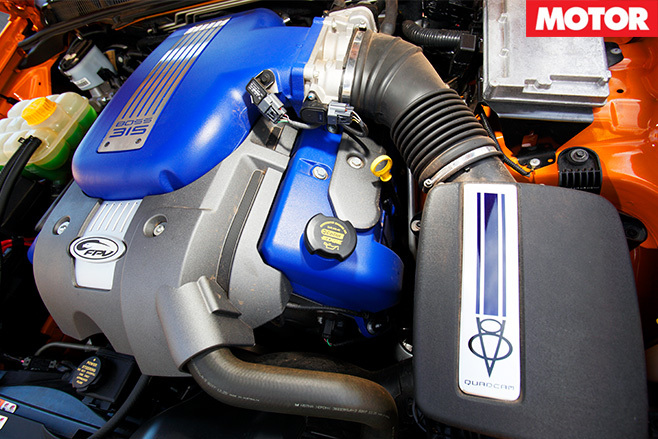 Even held in third gear, where the FPV is spinning closer to its engine’s high-rpm sweet spot, the HSV is still nearly a second-and-a-half swifter to 120. 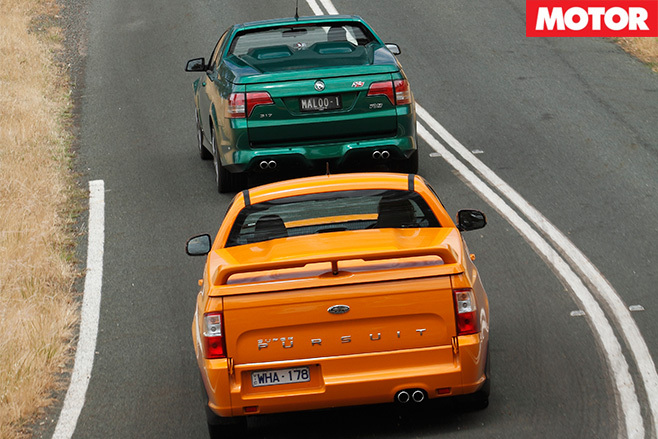 On the road there’s a marked difference, with the HSV literally pulling yards on the FPV when cranking out of corners. 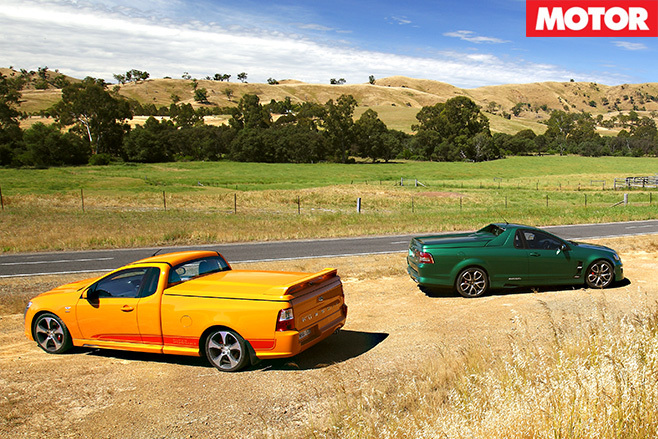 By the time the FPV has swung its tacho beyond 4500rpm, it's starting to honk, but it's too little too late, and the Maloo is already much closer to the far horizon. Braking? 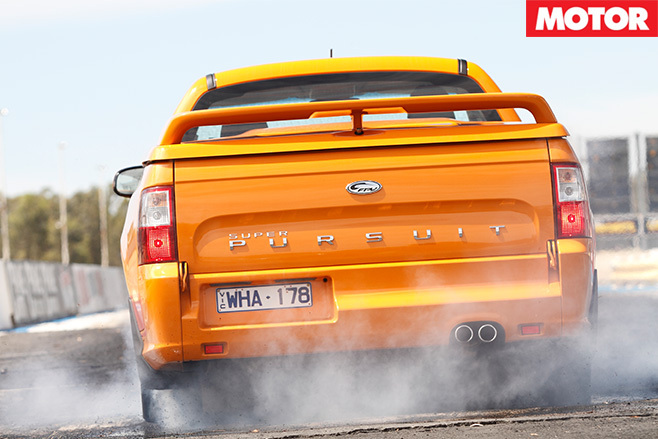 Both utes are extremely well endowed; the FPV copping six-pot front Brembos and the HSV large front four-potters. 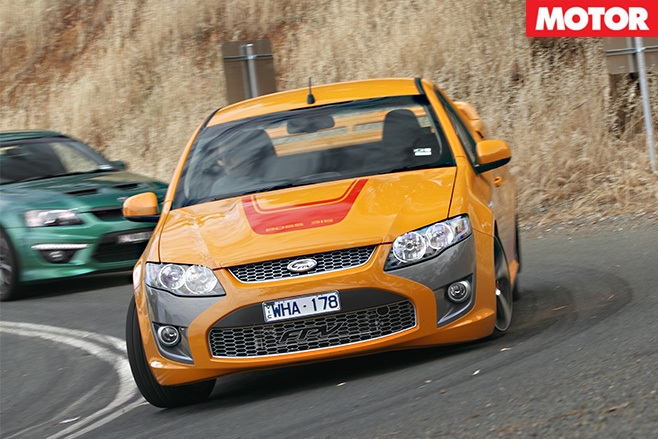 And while the Maloo stopped just over a metre-and-a-half shorter, that’s possibly down to tyres rather than hardware. Both make good use of their wheelbases, too, to remain surefooted under heavy braking, and mashing either’s brake pedal into the carpet is a simple, stress-free exercise. Neither ute is likely to be used for actually carrying too much – a dirt bike, an Esky and a swag are the most likely tray-loaded items. So you'd reckon the FPV's cart-sprung live-axle rear end would give it some degree of payload advantage. Nope. Even with its vastly more sophisticated independent rear suspension, the HSV is virtually line-ball with the FPV for load-lugging. 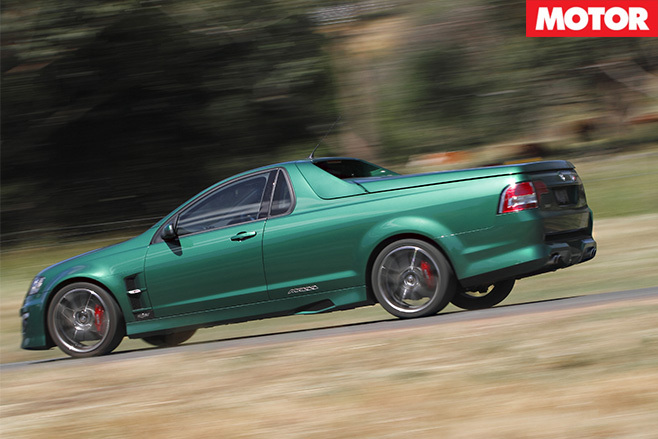 In fact, it boasts quite an advantage, with 427kg to the Henry and 500kg to the Maloo. The ride height is the ultimate load-limiting factor, it seems, and not the actual capacity of weight over the springs. That, however, is not the FPV’s major user interface blow-out. Nope, the big clanger would have to be the seating position. 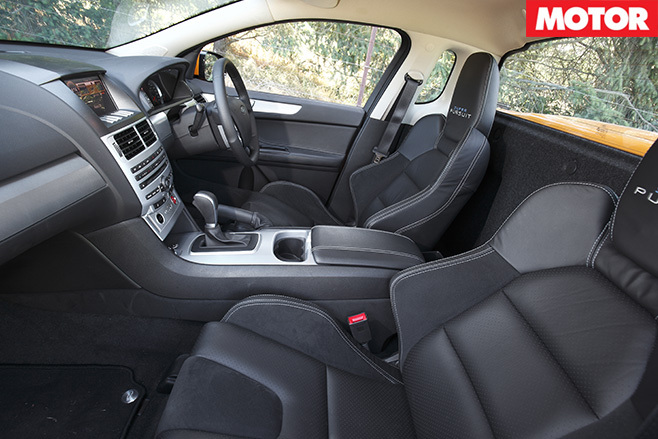 Look, the seats themselves are wonderful things, with nice high bolsters and plenty of padding in the right places. But the damn steering column is adjustable to an infinite number of positions, all of them way too low. The upshot is that it becomes a knee-banging chore trying to swing your legs under the steering wheel getting in and out, and it absolutely ruins the experience of sportiness because it makes you feel like you’re sitting on top of the car, rather than in it. Oh, and if the driver’s airbag ever goes off, the wheel is so low that should anybody ever produce 'Bee Gees – The Musical', you’ll be able to sing all of Barry’s high parts without trying. Ah yes, vision. I’m going to go out on a limb here and suggest that I can’t think of another current production car – and that’s including the Lamborghini Gallardo – that is so impossible to see out of as the current Maloo R8. And I’m not some small sunk-in-the-pew bloke, either. Looking forward, you’ve got the dreaded tree-like VE A-pillar. To either side, the B-pillar is smack bang in the way, even when looking over your shoulder. And the view to the rear is but a sky-high slit thanks to the Batmobile-hump hard tonneau. A small car could drive right past your tail-gate while you’re reversing and you wouldn’t know until you’d heard it go ‘crunch’. In fact, you'll have trouble even seeing the point of brushing your teeth and being good to your mother from the cabin of this thing. If I can’t see what’s around me, I can’t miss it. And hitting it makes me sad. It’s as simple as that. And should I even mention the colours? Okay, maybe somebody out there wants a Maloo in Candy-Apple Mould, but I can't think of anybody living or dead who would deliberately buy a Safety Cone Orange FPV with red stripes. While I'm at it, who told FPV that pumping the ute's rear wheel arches but leaving the same width rear axle in place was okay? It looks seriously wrong with the anaemic 245mm tyres tucked way up underneath. Maybe it'd be better if the FPV had the HSV's fatter rear hoops, but it doesn't, and that sort of sums up the whole thing. 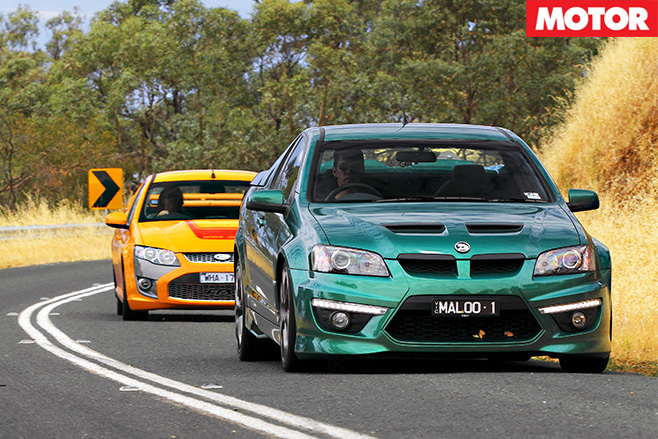 I can see that the Maloo is a sometimes-misguided attempt at a sporting ute for the chippie or sparky who's done good. 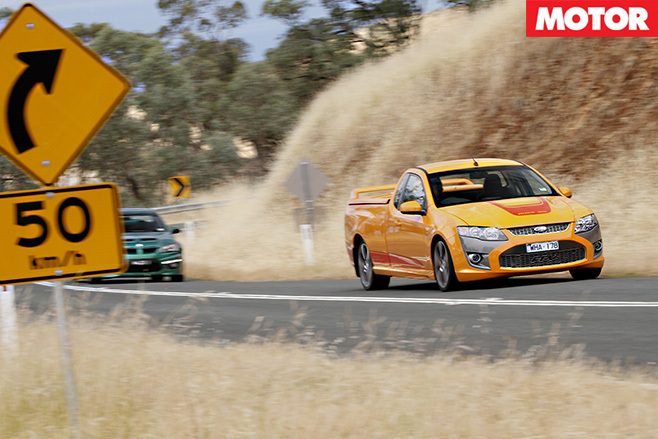 But even at $63,990 compared with the Maloo's $62,500 (manual) and $64,500 (auto) asks, the Super Pursuit feels much more like a parts-bin special. The FPV’s engine doesn't match the way people drive these things, the handling doesn't match up with the busy ride and the driving position doesn't match any normally proportioned human bean. Oh, and the overall look doesn't really match anything. 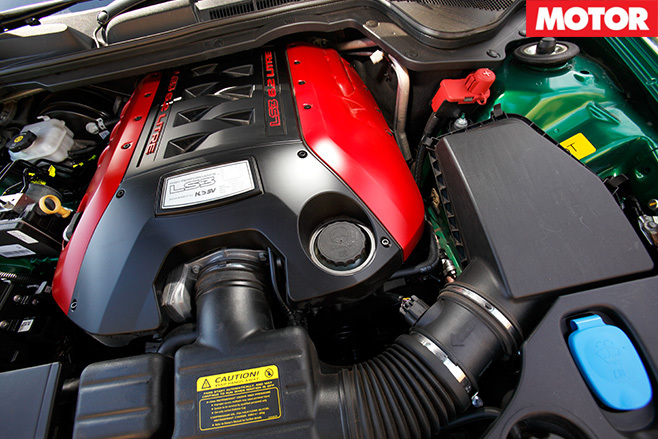 All of which kind of hands victory to the Maloo, because even though it's a black hole to sit in, it does have the best engine, the best ride-handling package, and it does offer the superior driving experience. And even the dimmest apprentice can see how that adds up. He just won't be able to see it – or much else, for that matter – from the HSV's driver's seat. FORD’S ‘PURSUIT’ nameplate has been around for ever (it was the branding for large-capacity Falcon sixes in the 60s), but it didn’t appear on a ute until 2002. 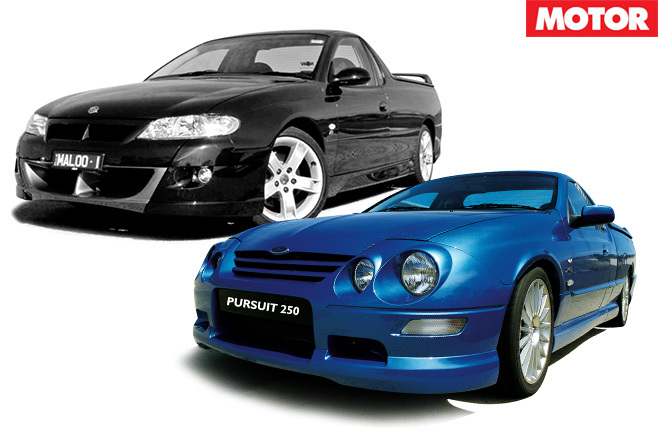 That car was the AU XR8 Pursuit 250 (pictured) – a Blueprint-blue, last-of-the-Windsor-V8 super-ute limited to just 250 units. And 250 stomping kilowatts. That final 5.6-litre V8 might have sounded a bit gruff at the top end, but in its 3000-5000rpm pleasure zone, with all that torque and all that old-school rumble, the Pursuit 250 was rock and roll, baby.